Watchfire Signs is proud to present the winners of the inaugural Watchfire Awards program, established to recognize Watchfire dealer partners, agencies, outdoor advertising companies and advertisers who showcase the capabilities of outdoor digital advertising. The awards were given in two categories: LED signs and digital billboards. Each category recognizes those who have displayed excellence in effectiveness, design, entertainment and legibility in digital messages. The 2015 Watchfire LED Sign Awards Grand Prize is presented to a Watchfire dealer partner who demonstrated the best use of a digital component in an on premise sign during 2014. This year’s Grand Prize is awarded to Spectrum Signs and Graphics, Inc. of Jacksonville, Fla., for their sign design at Orange Park Medical Center in Orange Park, Fla. The 2015 Watchfire Digital Billboard Awards Best of Show recognizes an operator and advertiser who utilized the outstanding capabilities of advertising on a digital billboard as demonstrated during the 2014 calendar year. This year’s Best of Show winner is Tri Outdoor, Inc. of Bethlehem, Penn., for their campaign with Penn State University’s Lehigh Valley campus. Spectrum Signs and Graphics’ award winning sign at Orange Park Medical Center includes a Watchfire 16mm digital display with a full color screen measuring 8 foot tall by 11 foot wide. The overall sign is a 22 foot tall by 13 foot wide aluminum structure featuring a double-faced UL pylon with ID panels and metallic silver paint with routed copy that is backed with white-plex and translucent vinyl. The display contains illuminated LED lettering, a top arched piece and painted orange reveals. 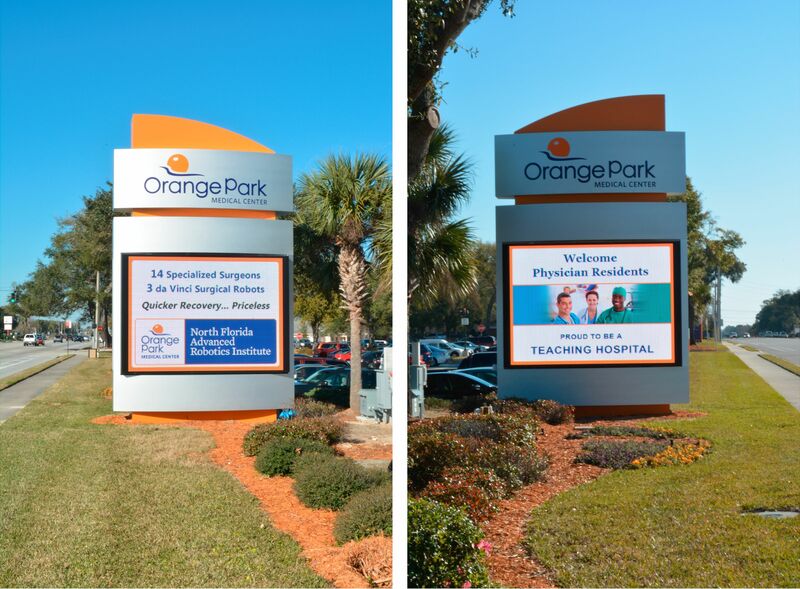 Orange Park Medical Center reports that the large digital LED sign allows them to enhance their brand with the public, and the full color display and image quality help to increase visibility. The sign incorporates a live RSS feed that provides real ER wait times to inform the public about the medical center’s short wait times. 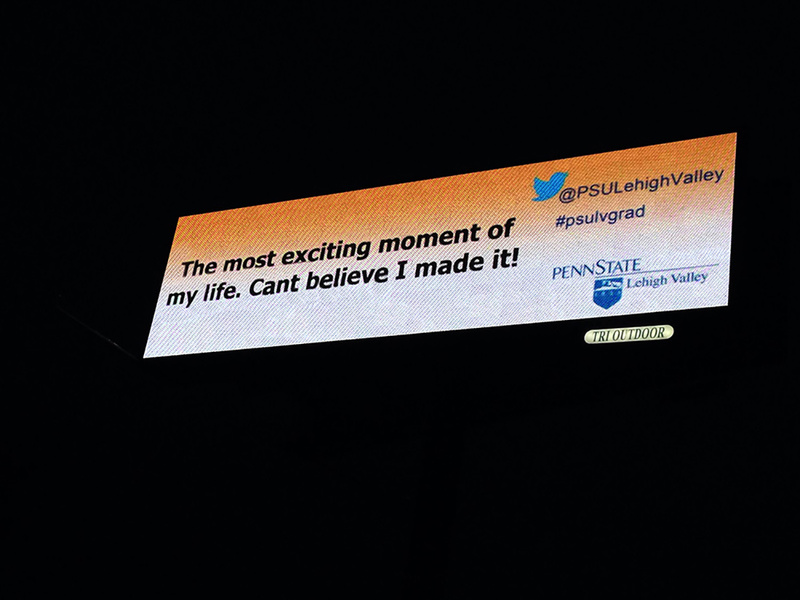 Tri Outdoor’s Sales Director and Partner Jason Wilson, collaborated with Penn State Lehigh Valley for the award winning “Onsite Tweet Penn State” campaign, which prominently featured a clean and legible design with live Twitter and Instagram posts during the campus’ May 2014 Commencement Ceremony, highlighting photos and tweets submitted by graduates, friends and family. The overall campaign began in advance of commencement with a branding initiative for the Lehigh Valley campus, followed by a countdown to the commencement ceremony and use of live social media before and during the event. Learn how businesses and organizations just like yours are increasing traffic and visibility with a Watchfire LED sign.